Apple says Australian customers will "soon" be able to add store credit cards and loyalty cards to Wallet, and use them to make purchases and redeem rewards with Apple Pay. Kohl's became the first U.S. retailer to offer store-branded cards in Apple Pay last month, while Walgreens launched the first stateside Apple Pay loyalty rewards program a few weeks ago. American Express is not as popular or widely accepted as MasterCard or Visa in Australia, but the partnership could place pressure on negotiations between Apple and Australian banks like Commonwealth Bank, NAB and Westpac. No bank-issued debit and credit cards work with Apple Pay in Australia at this time. Apple Pay recently gained support for Tesco Bank and TSB in the U.K. and over 90 new participating U.S. issuers. Yesterday, Apple confirmed that Apple Pay support is also coming to Domino's and Cinnabon in the U.S. by yearend and 2016 respectively. Starbucks, KFC and Chili's locations will adopt Apple Pay next year. 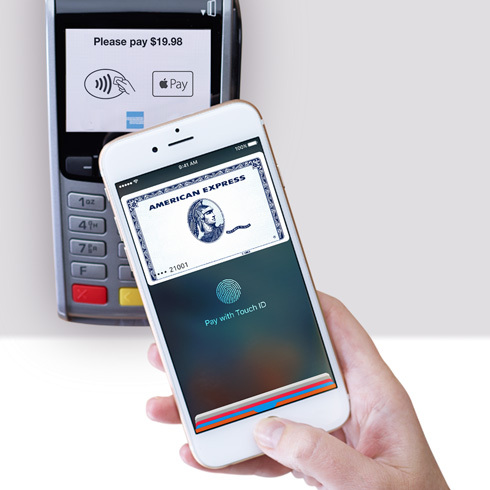 Apple's website has a new page with more details about Apple Pay in Australia. I'm confused by this sentiment. Last time I was in Australia about 50% of the stores that I saw had AmEx logos on their doors. Are they a particularly bad bank there or something? CONTACTLESS PAYMENT: Has been up and running for 5 years already by simply tapping your credit/debit card on the reader at almost every retailer, or more recently your phone with NFC chip sticker on the back. Apple Pay is not a revolution in Australia, its a "who cares" moment. So instead of tapping your phone or card, you tap your phone or watch. Whoop-de-doo!!! BANKS: there are four main banks in Australia who dominate banking. They take 82 cents per $100 card payment and they are unwilling to make a deal with Apple to hand over 15 cents when the contactless system that exists is in use everyday by nearly every Australian with a bank account. What's in it for the banks to do a deal with Apple? Nothing except a loss of profit. AMEX: in Australia has in the past charged retailers EXCESSIVE fees for accepting payments. To share the love, retailers have in the past either decided not to accept Amex or charged customers additional fees on top of their purchase cost. As a result many many Australians do not now and never will use Amex as they are viewed as overcharging scumbags. Some retailers, presumably in order top pick up the tourist dollar from overseas visitors, now accept Amex but for many Australians Amex carries a lot of negative baggage. - reducing its fees slightly to retailers, although their reputation is ingrained in the Australian psyche and some retailers still charge higher fees for using Amex because the public expects them too. - introducing co-branded Amex cards with the four banks (although these are usually supplementary cards to a Visa or Mastercard account with those banks). These are the bulk of Amex cards and WILL NOT WORK with Apple Pay because the banks will not give up their lucrative fees. Australia has real coffee, only stupid Americans go to Starbucks in Australia thinking it sells "coffee". This. Starbucks coffee is rubbish. There are many case studies as to why Starbucks failed in Australia - and the reason was because their coffee is horrible compared to local coffee shops that are literally everywhere. There must be at least several dozen people in Australia that actively use Amex. ... stick on NFC chip which is compatible with any smart pone. Stick on NFC chip... What could possibly go wrong?! ApplePay is infinitely more useful in Australia, Canada, and the UK when cards are loaded into the iPhone than it is here in the U.S. I have every single Amex and Visa card I own linked to ApplePay and almost nowhere to use ApplePay except for fast food joints. And Apple's big news is that Dominos, KFC, Chili's and Cinnabon will be supporting ApplePay soon. Great...even more places to use the technology that my waistline doesn't need. Just go to commonwealth bank and get a stick on NFC chip which is compatible with any smart pone. Much better than... Ugh... American express. Or, just tape your card to the outside of your wallet. That's about the level of security that a "stick on" NFC beacon would provide. I'm sure the 17 people in the country that use AMEX are having an amazing time.